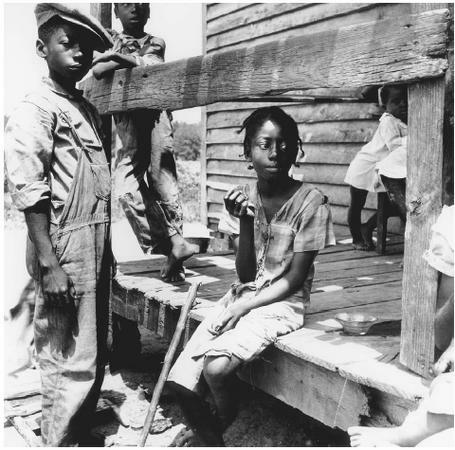 Roll of Thunder, Hear My Cry takes place in 1933 Mississippi. It's the height of the Depression, so jobs and money are scarce. The story is set on and around the Logan farm in Spokane County. As a matter of course, everything is segregated - schools, housing, churches, and businesses. Cassie Logan - The book's nine-year-old narrator, and a smart, independent protagonist with a strong sense of fairness. She's also brave and has a temper, and she's been protected by her family about a lot of the racist realities of the Deep South of 1933, all of which sometimes combine at times and threaten her safety. Stacey Logan - At 12, he's the eldest sibling and Cassie's big brother. He's protective of his family, and is significantly more aware of racism than Cassie is. At the beginning of the book, T.J. is his best friend, but Stacey must choose between that friendship what what is right. Christopher-John Logan - He's "a short, round boy of seven, [who] took little interest in troublesome things, preferring to remain on good terms with everyone" (Taylor, 2001, p. 5). He's empathetic and doesn't like to make waves, and he is the quietest of the siblings. Little Man (Clayton Chester Logan) - The youngest sibling, "always meticulously neat, six-year-old Little Man never allowed dirt or tears or stains to mar anything he owned" (pp. 3-4). He is beginning first grade, though he's been reading since he was four. Little Man seems unaware of racial differences or racism until he goes to school; like Cassie, he has a strong sense of what's fair and what's not and speaks out when he senses unfairness. Papa (David Paul Logan) - Papa loves his family and his land and is fiercely protective of both. He is away from home much of the year "in Louisiana laying track" (p. 7) in order to earn money to pay the mortgage and taxes. Mama (Mary Logan) - The Logan sibling's mother also teaches 7th grade, and this year has Stacey in her class. She is fired when she takes actions in her community and speaks out about racism in her classroom. Big Ma (Caroline Logan) - Big Ma is Papa and Uncle Hammer's mother and is "in her sixties, [and] would work like a woman of twenty in the fields and keep the house" (p. 7) in order to help keep the land. She's often called to nurse sick or injured community members. Uncle Hammer (Luke Hammond Logan) - Papa's brother who lives in Chicago. He's a war veteran and angers much more quickly than Papa in the face of racism. Jeremy Simms - Jeremy is white and a little younger than Stacey; he continually tries to befriend the Logans, even when they try to dissuade him. Lillian Jean Simms - Jeremy's spoiled older sister who firmly believes in the superiority of whites over blacks. She purposefully and publicly embarrasses Cassie, who carries out a long con to get back at Lillian Jean. R.W. and Melvin Simms - Jeremy's older brothers are racist and mean, much like their father. They pretend to befriend T.J. and then make him the fall guy for their own violent crime. Charlie Simms - Father to these four children. Charlie Simms constantly works to preserve white supremacy in "his" town. He bullies and threatens Cassie when she accidentally runs into Lillian Jean in the nearby town of Strawberry. Mr. L.T. Morrison - Papa meets him while working on the railroad and brings him home with the dual purpose of (1) helping Mr. Morrison after he was fired and (2) leaving his family with some protection while he is away. Mr. Morrison becomes part of the family and helps guard them and their property. He is a quiet man who is also physically intimidating or reassuring, depending on your perspective. Cassie says, "Anybody who was a friend of Papa's was all right in our book; besides, when he was near, night men and burnings and midnight tarrings faded into a hazy distance" (Taylor, p. 77). Wade Jamison - Mr. Jamison is a white lawyer who stands behind the Logans. He backs Mama's boycott and protects T.J. from the lynch mob. T.J. Avery - T.J. is a year older than Stacey, but failed 7th grade last year and so is in the same class as Stacey, with Mama as their teacher. He lies more often than not, and he constantly seeks the spotlight. T.J. is blinded by the attention R.W. and Melvin Simms pay him, and though he's not the best kid in town, he does not deserve the treatment he gets at their hands. Miss Daisy Crocker - Cassie and Little Man's "yellow and buckeyed" (p. 18) teacher doesn't see the problem with the "new" textbooks the school receives and takes a switch to them for their refusal to accept the books. When Cassie protests that the books label them as "nigra," Miss Crocker responds, "That's what you are" (p. 26). Harlan Filmore Granger - Granger owns land adjacent to the Logans and his family previously owned land that is now part of the Logan property. He wants "his" land back and seeks to undermine the Logans. The Wallace brothers (Kaleb, Dewberry, and Thurston) - These men run a store on Granger land. Sharecroppers on Granger land are able to get credit at the store, though they are charged exorbitant interest rates. Furthermore, the white brothers are violent racists who attack black members of their community. Keeping the Logan Land - Above all, Mama, Papa, and Big Ma work, scrimp, and save to earn enough money to pay the mortgage and the taxes. For Logan land, Papa "would work the long, hot summer pounding steel; Mama would teach and run the farm; Big Ma, in her sixties, would work like a woman of twenty in the fields and keep the house; and the boys and I would wear threadbare clothing washed to dishwater color" (Taylor, p. 7). Nearly every decision the adults make takes the land into account - keeping it in the family means keeping their independence, as landowning is especially rare for African-Americans in this setting. Every morning on their way to school, the Logan children are harassed by the bus driver who passes them with a school bus full of white students on the way to their school. The driver repeatedly runs them off the road and makes them fall in the muddy ditch. Stacey hatches a plan to retaliate, and he and his siblings dig a ditch across the road. The bus falls into it and breaks badly enough that it's out of commission for a while. Night men, a gang of white men, terrorizes the black community with threats of vengeance. Also every morning, Jeremy Simms forgoes the bus and walks part of the way to school with the Logan children. He never stops making overtures of friendship, even as Stacey and Papa try to dissuade him. Little Man and Cassie are whipped for their refusal to accept the schoolbooks Miss Crocker passes out on the first day of school. They object to getting "new" books in "very poor" condition and to being labeled "nigra" by the school district. Cassie notes "the covers of the books, a motley red, were badly worn and that the gray edges of the pages had been marred by pencils, crayons, and ink" (Taylor, p. 21). Mama quietly sides with her children, to the dismay of Miss Crocker, and she papers over the inner covers of her classroom's books so her black students will not see that they are purposely being given old, dirty books no longer deemed fit for white students. This act of defiance contributes to Mama's getting fired later on in the novel. Lillian Jean Simms purposefully and publicly embarrasses Cassie, and Lillian Jean's father, Charlie Simms, bullies her. Cassie retaliates by tricking Lillian Jean into thinking they are friends before luring her into the woods, beating her up, and forcing her to apologize. Cassie knows Lillian Jean won't tell on her because it would be too embarrassing for her to admit she was beaten up by a nine-year-old black girl. Mama leads a boycott of the Wallace store (Cassie comes by her moxie honestly!) after the Wallace brothers' lit the men of a black family on fire in an ultimately fatal attack. Mr. Jamison, the Logan's white lawyer, offers support by providing credit for several other black families who join with Mama. Without that support, sharecroppers who rely on seasonal influxes of money wouldn't have been able to participate. Although white landowners pressure their black sharecroppers to stop shopping in Vicksburg, Papa continues to take orders and make the trip. One night, the Wallaces retaliate by shooting Papa. In the melee, the wagon rolls over Papa's leg and breaks it. Stacey and Mr. Morrison are mostly unhurt. Mr. Morrison becomes more vigilant in his role as the family's protector. Although T.J. and Stacey are supposedly friends, T.J. doesn't treat Stacey (or anyone, really) very well. He frequently pressures Stacey to behave in ways that Stacey knows are wrong and often lies. T.J. eventually gets Mama fired from her teaching job, which hampers the Logans ability to earn enough money to make mortgage and tax payments. Once Stacey washes his hands of him, T.J. is taken in by the apparent offers of friendship from R.W. and Melvin Simms. The Simms ultimately frame T.J. to take the fall for their own violent crime. After he arrives at the Logan's, beaten and bloodied at the hands of R.W. and Melvin, Stacey agrees to get him home so that T.J.'s father won't throw him out. Unfortunately, they arrive just in time for T.J. and his family to be attacked by a lynch mob. Mr. Jamison reasons with the mob in order to save T.J.'s life until a lightning-kindled wildfire breaks out on the edge of the Logan's fields. The mob breaks up as the entire community - black and white - works together to put out the fire, which threatens everyone's crops and livelihoods. A roll of thunder heralds the rainstorm which helps finally put out the blaze. Cassie figures out that Papa actually set the fire to distract the lynch mob. And although Mr. Jamison, Papa, and some others managed to save T.J.'s life that day, Papa admits that it's likely T.J. will suffer or even die on a chain gang. Even though she didn't like him, Cassie cries in her bed for "those things which had happened in the night and would not pass. I cried for T.J. For T.J. and the land" (Taylor, p. 276). "He took my hand and said in his quiet way: 'Look out there, Cassie girl. All that belongs to you. You ain't never had to live on nobody's place but your own and long as I live and the family survives, you'll never have to. That's important. You may not understand that now, but one day you will. Then you'll see.' I looked at Papa strangely when he said that, for I knew that all the land did not belong to me. Some of it belonged to Stacey, Christopher-John, and Little Man...Big Ma, Mama, and Uncle Hammer...But Papa never divided the land in his mind; it was simply Logan land" (Taylor, p. 7). and the "gray stillness" (p. 171) of a January morning. The children's walk to school is often treacherous, and they are often frustrated and upset. Cassie is never truly enthusiastic about attending school, and the path there is often challenging and discouraging. In October, the rainy season began. "At first the rain had merely splotched the dust, which seemed to be rejoicing in its own resiliency and laughing at the heavy drops thudding against it; but eventually the dust was forced to surrender to the mastery of the rain" (p. 42). The rain's victory over the dust can be seen as a metaphor for Cassie's growing understanding of racism and the black-white divide. Of course, the ending of Roll of Thunder, Hear My Cry is dramatized by the "violent clap of thunder" (p. 265), lighting, and eventual rain that helps put out the (supposedly) lighting-sparked blaze, just as the fire helped put out the fiery, violent lynch mob. When Cassie, Little Man, Christopher-John, and Jeremy felt the first cool drops of rain, they "laughed, whooping joyously into the thundering night" (p. 266). Just as the storm reflects the rising violence, the rain echoes the breaking tension and renewal of hope. The importance of family in Roll of Thunder, Hear My Cry cannot be overstated. The Logans function as a team, and even if they don't always agree in private, the public perception is of one unity. Their home and land, too, was shared between the Logans; although Big Ma had the deed in her name until she transferred it to her sons , "Papa never divided the land in his mind; it was simply Logan land" (Taylor, p. 7). Early on in the story (Chapter 2), Papa declares, "In this family, we don't shop at the Wallace store" (p. 41). The Logan adults don't like the way the Wallaces treat black folks, nor do they like how some of the community's older children behave when they are there. So with Papa's ban, which none of his children argue against, the family acts as one. For Christmas, Uncle Hammer gives Stacey a beautiful, warm, winter coat. T.J. coerces Stacey into "lending" it to him (on a permanent basis) by making fun of how large the coat is for Stacey and telling him it makes him "look like a preacher" (p. 141). "In quiet anger [Mama] glared at Stacey and admonished, 'In this house we do not give away what loved ones give to us. Now go bring me that coat'"(pp. 141-142). While Uncle Hammer is most upset that Stacey let himself be tricked, Mama's fury is at the disrespect shown to a family member. Because of the financial hardships of Mama loosing her teaching job and Papa's broken leg preventing his working on the railroad, Uncle Hammer sells his shiny, beautiful Packard. The cash will go to pay the all-important taxes and mortgage. When Papa protests that he didn't mean for Uncle Hammer to have to do that, "Uncle Hammer put his arm around Papa. 'What good's a car? It can't grow cotton. You can't build a home on it. And you can't raise four fine babies in it'" (p. 236). Family, and their land, always take precedence. "Cassie, there'll be a whole lot of things you ain't gonna wanna do but you'll have to do in this life just so you can survive. Now I don't like the idea of what Charlie Simms did to you no more than your Uncle Hammer, but I had to weigh the hurt of what happened to you to what could've happened if I went after him....I don't like letting it be, but I can live with that decision But there are other things, Cassie, that if I'd let be, they'd eat away at me and destroy me in the end. And it's the same with you, baby. There are things you can't back down on, things you gotta take a stand on. But it's up to you to decide what them things are" (pp. 175-176). Taxis (1986) asserts, "Cassie's growth from a naive, vulnerable child - who has been successfully sheltered from the full force of the pervasive racism of her era - into one who is wise beyond her years, and imbued with the self-confidence necessary for the struggles sure to come, is handled in a manner that never strains credibility" (p. 260). "Far as I'm concerned, friendship between black and white don't mean that much 'cause it usually ain't on an equal basis. Right now you and Jeremy might get along fine, but in a few years he'll think of himself as a man but you'll probably still be a boy to him. And if he feels that way, he'll turn on you in a minute....Maybe one day whites and blacks can be real friends, but right now the country ain't built that way....down here in Mississippi, it costs too much to find out....So I think you'd better not try" (pp. 157-158). Later that night, after thinking about what Papa had to say, Stacey placed the flute "in his box of treasured things. I [Cassie] never saw the flute again" (p. 158).